Hiro (Kyoto, Japan) on 23 September 2016 in Miscellaneous. Quel banc et rendu sur la matière avec les feuille et les gouttes. It has a flat screen on the wall ready and it could be called "Autumn". In all simplicity a fine picture. Nice view on the wet coloured stripes : a great idea. Makes a strong and identifiable study . . we have all been there ! Espléndida vista otoñal con lindos colores y luz. ***** Buenos días. Excellent capture of the raindrops. Nice detail and color. Très belle ambiance automnale sublimée par les couleurs et la présence des gouttes de pluie! LOVELY raindrops Hiro !! Wonderful feel here..
Splendid framing and tones ! Those leaves stick to everything when they are wet. Nice droplets, too. 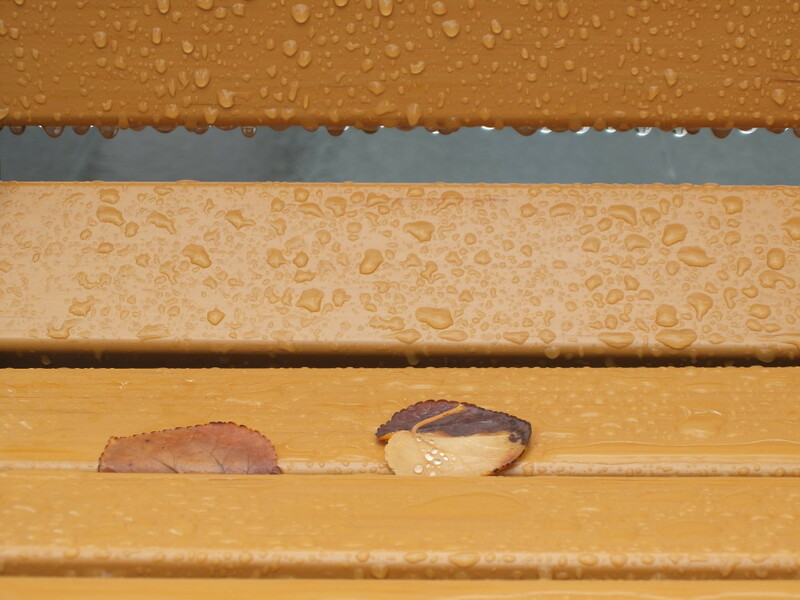 The colors of the leaves match so well with the paint of the bench. Fantastic detail shot, fine sharpness. The rain is beautiful in this picture ... peaceful composition Hiro! That is gorgeous. So crisp. Superb composition! Beautiful colors and details! Beautiful composition! Very poetic presentation of autumn! The autumn announces the color in a composition nicely graphic ! Good eye Hiro. What a lovely abstract. Perfect balance of element.